Omgosh I’ve always loved cake rolls or jelly rolls, even as a kid I was enchanted with them! I started learning to make them when I was 12 or 13, and my mom helped me make a chocolate cake roll. This Pumpkin Roll is basic and perfect in my opinion. Moist pumpkin cake wrapped about cream cheese filling? What’s better?? Nothing! This Pumpkin Roll is easy to make because it uses canned pumpkin from the pantry. No need to cook, puree and strain a fresh pumpkin. Although you can ABSOLUTELY cook and strain a pumpkin if you like. Or if you want to. Or if you have pumpkins to use up. A Pumpkin Roll is a lovely dish to bring to any potluck or party. Anywhere you want to impress people with your cooking prowess and look good while doing it, make a Pumpkin Roll. 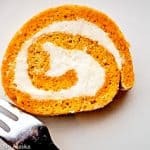 Don’t be scared off by the rolling of a cake roll. It’s simple, and I walk you through it in the directions. The hardest is not overcooking the cake so that it rolls nicely and doesn’t split. Other than that, you’re just following instructions. Omgosh I've always loved cake rolls or jelly rolls, even as a kid I was enchanted with them! This Pumpkin Roll may be plain and simple but it's perfect for guests.